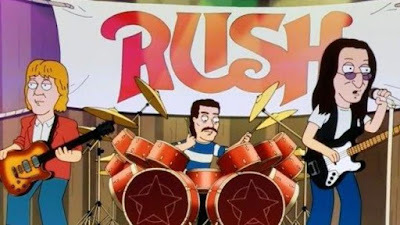 Rush rocked their 1981 classic, “Tom Sawyer”, on the latest episode of the animated Fox sitcom Family Guy. Part of the show’s storyline presented a look at Mark Twain’s The Adventures of Huckleberry Finn, with mainman Peter Griffin as Huck Finn and his son, Chris, as Tom Sawyer. When the pair are joined by runaway slave Jim – played by Cleveland Brown – Tom rips off his shirt to reveal a Rush concert t-shirt underneath and shouts, "Rush concert!" Up next for Rush, the group will release multiple expanded 40th anniversary editions of their 1976 album classic, “2112”, on December 16. Moon and Alice In Chains. The set’s third disc is a DVD featuring a newly restored vintage 1976 Rush concert recorded at the Capitol Theatre in Passaic, NJ, plus bonus videos of the Grohl/Hawkins/Raskulinecz track and Billy Talent track, and a new 25+ minute interview featuring Rush guitarist Alex Lifeson and longtime producer & engineer Terry Brown. The new "2112" remaster originally appeared on the much-acclaimed 2015 hologram vinyl edition of the album; this marks the Abbey Road Studios master first time on CD. A 3-LP 200-gram vinyl edition includes all of the above plus a special laser-etched LP side, the 2015 hologram on 2112’s side B and a unique turntable mat featuring the band’s iconic Starman character.